An artist rendering of the proposed 16-story building on Sherman Avenue. Architects presented detailed plans for a proposed 16-story, 287-unit residential building that they hope to build at 1454 Sherman Ave. to Evanston’s Design and Project Review Committee on Wednesday. The development would include a small public park, a 185-spot parking deck — built into the building, with access through a back alley alongside the CTA train tracks — and 13 floors of apartments, according to the plans presented by Andrew Yule, vice president of development at Albion Residential. Albion, a Chicago-based apartment development group, is behind the project, which Yule said will appeal to renters because of its proximity to downtown Evanston and the Davis Street El station and its affordability — 80 percent of the units will be studios or one-bedroom. The proposed building would require the demolition of two existing bars, Tommy Nevin’s Pub and Prairie Moon, but would include first-floor retail space for one restaurant and two retail businesses. Yule said Albion intentionally did not seek to rezone the property from “transitional” to residential, and hopes that the sidewalk businesses, in addition to outdoor restaurant seating extending into the park, will maintain the commercial feel. 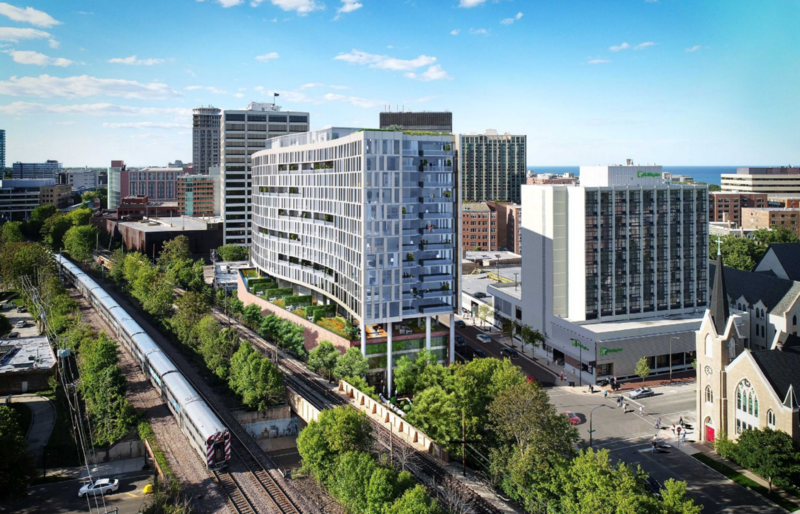 The proposed building has an unusual S-shape, which architect Paul Alessandro said was inspired by the curvature of the Lake Michigan shore, the CTA train tracks and Ridge Avenue in Evanston. “Our building derives its design from that contradiction — a diagonal grid, which is represented by the base of the building, and that curve, which is represented in the upper portion of the building,” Alessandro said. The DAPR board gave more minor recommendations after the presentation, ranging from increased alley signage, to bird flyway compatibility, to resizing a proposed Divvy bike station. Economic development manager Paul Zalmezak thanked Yule for moving the parking deck entryway from Sherman Avenue, as was shown in a previously presented proposal, to the back alley. Two people who criticized the project during the public comment portion of the meeting, including Evanston resident Carl Klein, said the building would continue a trend of prioritizing new developments over preserving historic buildings and providing affordable housing. “Developers are thus directing the transformation of downtown Evanston — into blocks of high rises that are dark, windy, unappealing with (often empty) chain stores and wiping away downtown’s cherished character,” read a three-page document of complaints that Klein distributed to the board. Yule, however, said the current floor plan and exterior design is the product of feedback from a May community meeting, City of Evanston staff review and online comments, and that the architects will now get to work taking the feedback they received Wednesday into account. The plans will be discussed further and potentially voted upon at next week’s meeting, DAPR board chair Johanna Leonard said.